Any agreement that creates, express, or implied, an obligation on the contracting parties is a contract. There are various kinds of contracts that as an individual or a company you enter into during your lifetime. At times these contracts are subject to a legal dispute and its interpretation is the main legal contention to know whether the defendant is at fault or the plaintiff. As there is no Federal Law regulating contract law in the United States; the contracting parties are free to choose the court of choice at the time of entering the contract. 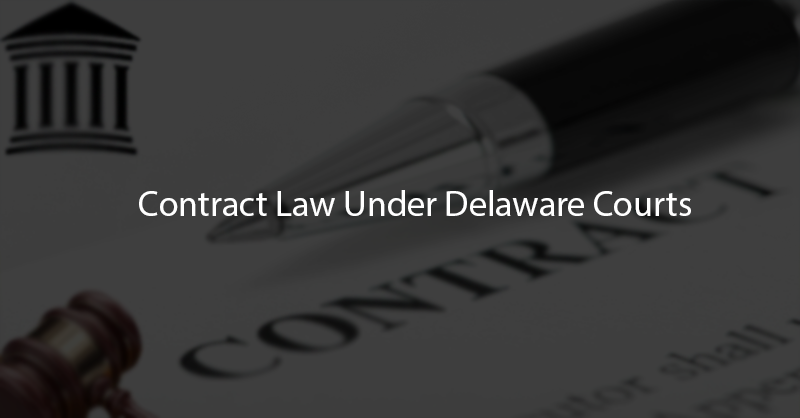 As a popular practice, companies tend to select the First State, Delaware as the Court of Choice due to the existing corporate laws. The courts in Delaware for contractual disputes consider factors such as the existence of a contract, violation of contractual agreements, and subsequent damages as the background for discussing breach of contracts. While deciding whether the agreement between the plaintiff and defendant can be considered as a legally binding contract the first test is written agreement. The Chancery and the state government by various judgements and statutes – Code 1852, § 1167; 13 Del. Laws, c. 451; Code 1915, § 2626; 38 Del. Laws, c. 157; Code 1935, § 3106; 48 Del. Laws, c. 224, § 1; 6 Del. C. 1953, § 2714; 67 Del. Laws, c. 189, §§ 1-3; 70 Del. Laws, c. 186, § 1. – has made it amply clear that any agreement to be legally enforceable as a valid contract has to be a written agreement between parties. If all the aforementioned conditions are met then it is a valid contract. The contract ceases to exist if any of the parties breaches the terms and condition of the contract due to non-performance. Material breach – any act that defeats the purpose of the contract can be considered as a material breach. For example, the caterer fails to deliver the wedding cake on the wedding day. This non-performance defeats the whole purpose of the contract. Immaterial breach – any act that slightly deviates from the conditions of the contract can be considered as an immaterial breach. For example, the caterer delivers the cake at 2PM on the wedding day against the promised time of 1:30 PM. Though this is a breach of contract, but it hasn’t resulted in a complete breach. Based on the non-performance of the parties the remedy is decided by the courts. It can be either in form of financial payment or asking to fulfill the original terms of the contract or initiate criminal proceeding depending upon the damages suffered and the reason for the non-performance. In the aforementioned example, the caterer can be asked to pay financial damages for non-delivery of the cake if it was due to avoidable circumstances. At times it is not possible for the parties to fulfill the contract due to unforeseeable circumstances such as death, accident, war or any natural calamity. In these situations, no penalty is levied by the court and these can be considered as vis major, i.e., acts of god. For more detailed information or to file a case regarding contract law under Delaware courts, consult an attorney. Submit form below to speak with a local attorney today! What to do with Lemon Car? How Can a Lawyer Help you with Credit Repair? How Can a Lawyer Help You Avoid Foreclosure? By submitting my information, I authorize a legal provider to contact me at given phone number above regarding my legal matter.